Packed with juicy cherries & a hint of almond, Cherry Clafouti is one of the first dishes I make when cherry season rolls around. It’s perfect as a light dessert, and leftovers make a fantastic breakfast treat. Remember the case of cherries I got through my co-op a couple of weeks ago? 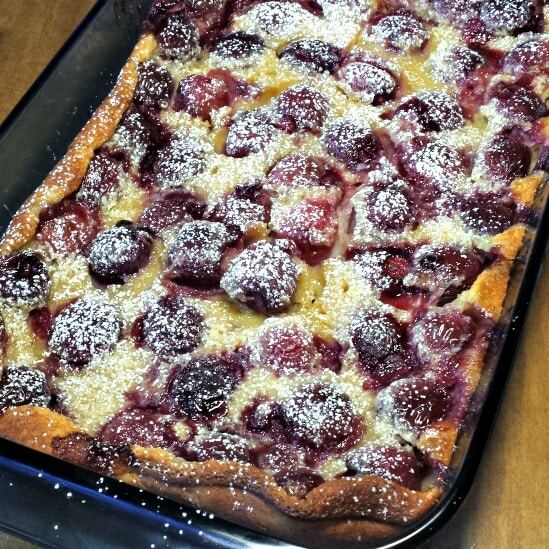 After eating a couple bags straight up, the first dish I made was Cherry Clafouti (pronounced klah/foo/tee). Isn’t that a fun word?! I like to make Clafouti just so I can say “Clafouti”!!! Sorry, it’s just so easy to get distracted when the topic at hand is Clafouti. 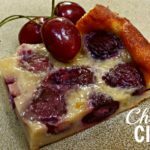 Cherry Clafouti tastes amazing – creamy custard and sweet, juicy cherries, hint of vanilla and almond – what’s not to love?! And that “crust” around the edges – bomb! While the name sounds all fancy, this is really just a simple custard dessert. And the fact that it contains eggs means it’s perfectly OK to eat for breakfast, right? Right! If you’re truly feeling adventurous, feel free to substitute other berries or fruits. Although I haven’t strayed from my favorite cherry version yet, I have been told this recipe is just as tasty with other fruits. Preheat oven to 350 degrees. Lightly spray a 10×7 baking dish with non-stick spray. Add the cherries to the sprayed dish. Whisk the eggs, sugars, salt and flour until smooth. Add milk, almond extract and vanilla extract to the egg mixture and continue whisking until smooth. Pour mixture into the baking dish. Bake for 40-50 minutes, or until lightly browned (a toothpick inserted in the center should come out clean). Cool on a wire rack. The Clafouti will puff up while baking and deflate while cooling. Slice and serve after the Clafouti has cooled. You can dust with powdered sugar if desired (I usually skip this). Refrigerate leftovers (I’m giving you permission to eat the leftovers for breakfast). 7/12/16: photos and post updated. Preheat oven to 350 degrees. Lightly spray a 10x7 baking dish with non-stick spray. Add the cherries to the sprayed dish. Slice and serve after the Clafouti has cooled. You can dust with powdered sugar if desired (I usually skip this). Refrigerate leftovers (I'm giving you permission to eat the leftovers for breakfast). We have a Cherry tree in our garden and are hoping for a good crop this year. Your Cherry Clafoutis look absolutely yummy. Pinned! Ooooh, a cherry tree in your garden?! I can only imagine how awesome that would be, Sammie! 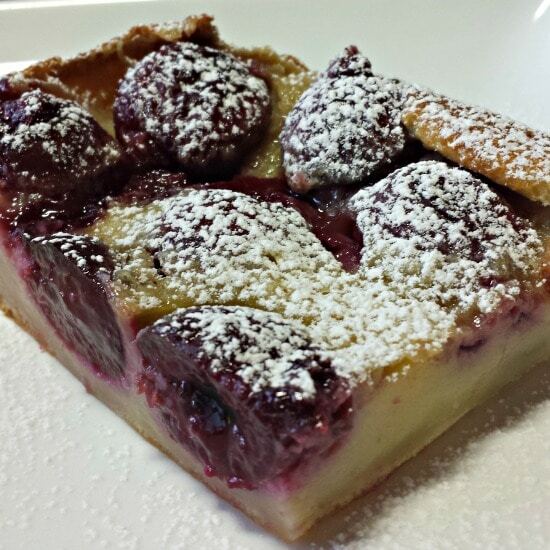 We would really enjoy your beautiful Cherry Clafouti! Thanks so much for sharing with us at Full Plate Thursday and have a great weekend!